Keep things classic and cool with a small leather messenger bag, featuring your photos or designs – the original personalized men’s bag. Combine classic style with a custom contemporary finish, crafted from fine black Italian leather and with a 2-year guarantee. 11.81" x 10.23" x 3.94"
Bring an element of smooth style to your wardrobe or buy him a gift to remember with these sleek personalized men's bag. The messenger bag is crafted from fine black Italian leather by our talented makers onsite, with an adjustable thick webbing shoulder strap. Inside you’ll find three secure zip pockets so your valuables will stay hidden and safe wherever you go. With a two year guarantee, we’re sure that your new shoulder bag will be your everyday accessory for all your essentials. Take advantage of our quantity discount to create a range of striking bags for special gifts. Buy 2 and get them both at a lower price. When you design your own man bag with Bags of Love, we use a smooth 100% real Italian nappa leather to print your designs on – all made onsite in our factory. Using a professional printing process, the inks are directly fused into the fibers of the leather, resulting in a permanent print which won’t scratch away or fade over time. The colors of your design will be vibrant, with an even, consistent tone and sharp details. The Italian leather has a natural surface shine, but after a year it will begin to develop a charming distressed appearance which will show off the unique leather quality of this bag – true authenticity. Care: To keep your new bag looking fresh, wipe clean with a damp cloth. After 12 months of use, your bag will naturally develop a distressed leather look. Bold graphics and bright colors really come to life on our leather bags. Try creating a graffiti design to give your leather bag an urban edge, and combine street art with a classic design for the ultimate style piece. 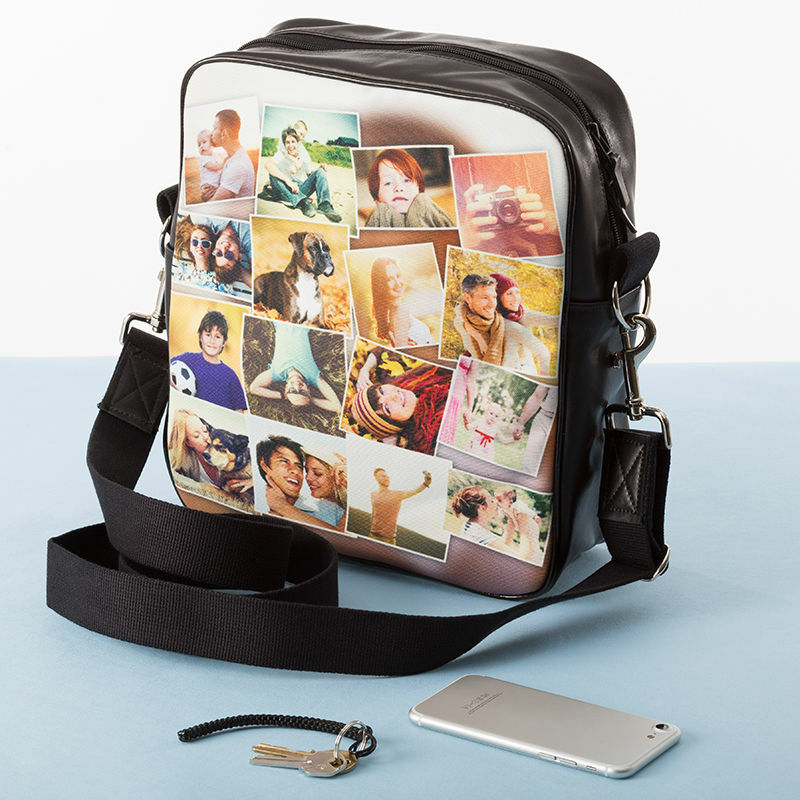 If the bag is a gift for the special man in your life, why not print a photo of the two of you sharing a happy memory? Give him a present he’s sure to never forget. Personalized men's bags are perfect for keeping your valuables and any essentials with you when on the move; particularly for days out or travelling to work or college. This is a wonderful alternative to a heavy briefcase or backpack, and is comfortable and lightweight to wear when you’ll be up and around all day long.